Convention season is fast approaching. That means a veritable plethora of conventions, fests and other assorted geekery to sink your teeth into. We here at Geek Pride will endeavour to visit many of these cons to bring you the low down on them. Everything from the biggest mega Expo’s to the smallest local conventions. If it is on, chances are one of us will be there. One of the first ones we will be attending this year is a relative newcomer. Stoke-Con-Trent is in only its 4th year and is run on the 17th of April. The Fifth Doctor himself, Peter Davison. The ever fierce bounty hunter, and subject of the even fiercer debate on Who shot first, Peter Blake (Greedo). From Game of Thrones, none other than Miltos Yerolemou, better known as Syrio Forel. Joining these stars are other actors from a whole range of TV shows and Movies as well as writers and artists from some of your favourite graphic novels and comics. As with previous years, there will also be an X-Wing replica on show, an Iron Throne and the Tardis itself. I will be attending to give you a full run down on the goings on. 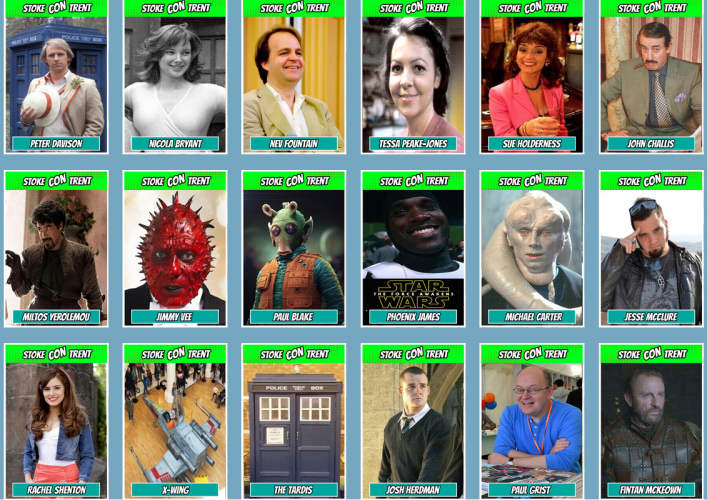 Just some of the confirmed guests at the 4th Annual Stoke Con Trent. Are Merchandise Stalls at Conventions a Con?